Sian LeSueur, left, and Nancy Szastkiw of the Mainland BC Military Family Resource Centre, stand at the cenotaph to Canada’s fallen soldiers on the Walk to Remember in Langley. Sian LeSueur threw a 26th birthday party for her son last month with friends and family, cake and candles. But Garrett Chidley wasn’t there to make a wish; he died four years ago while serving in Afghanistan. In today’s Canada, where the sacrifices of wartime are a distant notion, mothers of fallen soldiers make a small, sometimes lonely group. Seven such women who live or have lived in B.C. came together for a retreat earlier this year in Vancouver and eight fathers are doing the same this weekend. LeSueur first came up with the idea and Nancy Szastkiw, a family liaison officer with the Mainland B.C. Military Family Resource Centre in Vancouver found the money to make it happen. The Toronto-based charitable foundation True Patriot Love contributed about $10,000 toward the mothers’ event and the Military Family Resource Centre fronted the same for the fathers. Both are unique in Canada. Szastkiw says many of the women were reluctant to sign up at first, but ended the three-day psycho-social program feeling they had made new bonds with other women whose sons died in Afghanistan or later at home, either by their own hand or, in one case, by the hands of police. When the last troops came home from Afghanistan last month after operations there since 2001, the number of Canadian casualties totalled 158 soldiers, two civilian contractors, one diplomat and one journalist. LeSueur’s son died along with four others on one of the deadliest single days for Canadians in Afghanistan when the armoured vehicle he was driving was destroyed by an explosive device. “There’s no time limit on grieving and when it’s your own child it never — ever — goes away. I remember people saying to me a few months after Garrett died, ‘When is the old Sian coming back?’ Well, she’s never coming back. For LeSueur, there’s a Silver Cross, a medal no one wants to receive, for a son who died during service to his country. 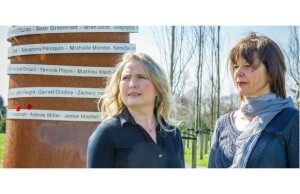 For those who lost children to suicide, there are no honours. “I think they’ve been through a lot more than I could ever imagine. Knowing that your child comes home and you finally think that they’re safe then they take their own life … They need the help more than anybody,” LeSueur says. At least 10 suicides were reported in the ranks in 2013, although no official count is yet available. A report by the Canadian Armed Forces noted 42 confirmed deaths by suicide among regular military personnel and reservists in 2011 and 2012. She went public, prompting an apology from the defence minister in the House of Commons. “I don’t think that enough is said for the ones who have committed suicide, who have been just as brave as the other ones,” says Lorraine Matters of Prince George. The death of her son Greg was the subject of an inquest, which ruled it a homicide, but blamed no single individual. Greg Matters was 41 years old, living with his mother and diagnosed with post-traumatic stress disorder when he was shot in the back by an RCMP emergency responder in a 2012 standoff. He was holding a hatchet at the time. Matters was a career military man at the rank of master corporal before this discharge and had served with peacekeepers in Bosnia. For Matters, the retreat marked the first time she has felt comforted by people outside the tight circle of her family and friends. The weekend started with a makeover mixer for fun, but moved on to practical advice for dealing with trigger points like birthdays and holidays, proper nutrition, relaxation and mindfulness techniques — calm awareness of each moment of the day, while observing passing feelings without judging them good or bad. Lynette Pollard-Elgert, executive director of Living Through Loss Counselling Society of B.C., was the keynote speaker at the women’s weekend and will do the same at the fathers’ event. She has worked in the field for 30 years and says their experiences are exceptional in several ways: those who lost sons to war are told the deaths were heroic which can make their sadness seem less legitimate; suicide and violent deaths often revictimize the grieving parent for somehow not doing enough to protect their child. Add to that a general unease with overt grieving and the result is isolation. “North America is a death and sadness-denying society. We don’t know what to do with you if you’re sad or crying. We are uncomfortable and we have very few rituals other than a funeral. After that you’re on your own,” says Pollard-Elgert. “The loss of your child is one of worst losses you can experience. Yet the community allows any kind of loss to be supported for between six weeks and three months and after that we want you to be healed and be back to normal. The problem is that most people don’t even know what happened to them until three or four months later because the shock is so intense when you’ve lost a child, especially through something like war. For the rest of us she advises showing up without being asked. “I think the best thing we can do is be there and not say to people, ‘Call me if you need help’ because people who are in deep grief don’t have the energy or wherewithal ask for help. Generations have passed since the First and Second World Wars when most Canadian families felt the death of a loved one overseas. Now families of the fallen have to seek out others spread across the province and the continent. Leona Stock, now of Cochrane, Alta., reluctantly travelled to Vancouver for the mothers’ weekend, which she found unexpectedly therapeutic. “We felt a connection. We weren’t alone in this. We were able to talk about it without having to give a backstory, an explanation. Her son Stephan died at 25, killed by a bomb in Afghanistan in 2008. The family used to live in Campbell River and then Tsawwassen where Stephan graduated from high school and played football for the school team, which has since retired his number. Her husband is here for fathers gathering in the hope, too, of finding solace.